It is difficult to pick the best mud tires or off road tires. There are various size, shapes and types of tires for all situations. As you can pick any type of tire for off-roading, there are the types that works better specifically off road and some that can work either ways. For instance, the all-terrain tires are suitable for anything from driving in city or for snow, mud or sand. The best ones are designed to only for off roads through sand, rocks and mud have improved traction. Right type of tires which suits you lifestyle can make big differences in the way you enjoy your own hobbies. For most if not all people, having best all terrain tires is what they all need. You would not need to bother about changing them out so that they can perform for any condition. For true outdoor passionate, it is recommended to use 2 sets of tires. One for daily commuting and other one for weekend adventures. Finally make sure to research and then purchase right sized tires for your vehicle. Here are the reviews for some top brands on market and preferably we discuss the size 33. Although you can scale up or down on the basis of your personal preferences, we also rate them on durability, off road capabilities, fuel efficiency, control or braking. For road performance BFGoodrich All Terrain series is the best in fact a beast and incredibly durable. It’s impossible to find tires that are perform great on highways and paved roads as well as get bit roughed during weekend Probably you can get a good 50 Kilo miles from such tires. Specifically formulated tread is designed to reduce tear and chip from gravels and road debris. With interlocking treads, these tires are incredibly stable on highways and have excellent handling and control. These tire improves fuel efficiency with low rolling resistance. Sidewalls are 20 percent tougher because of CoreGuard technology therefore your tires will be safe while you are driving through hazardous conditions of roads and sharp items from splitting the sidewalls of your tires. Generally, BFGoodrich are best among all other all-terrain tires and probably even best mud tires for individuals who want durable tires for driving inside the city and occasionally treading the offroads. It is a serious contender against BFGoodrich T/A KO as well as the best among all. 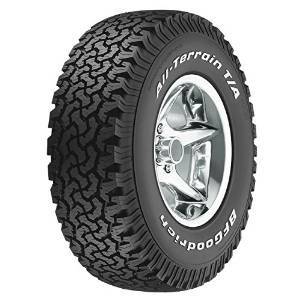 As BF Goodrich All Terrain T/A KO is a popular brand, it doesn’t mean you should ignore Mickey Thompson. As a matter of fact it is also owned by a popular brand, Cooper Tire. MTZ are radial so sidewall flexing isn’t transferred to the tread, and hence results in decreased transversal slipping. It means your car will transfer more power to ground, increases durability of tires because of reduce ground damage and compaction as well as improve fuel efficiency. These tires have multi lug design which allows for quiet drive on paved roads and highways at higher speeds. So you can handle well off road. 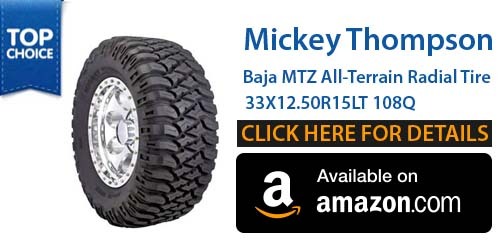 Although Mickey are considered all terrain, they are better off road as compared to BF Goodrich All Terrain T/A KO. With 3 ply sidewalls and 6 ply tread, Mickey Thompsons are best for mud. Extra layer of protection makes it a perfect shield against punctures. They include best tread wear and great traction over mud as well as snow along with self-cleaning high void lugs and the SideBitters technology. As both lugs have excellent amount of dead space in between, there is an added traction and the bite in harsh conditions and extra ability of cleaning itself. 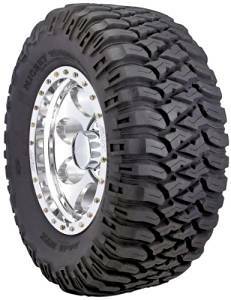 As these tires don’t have a grip similar to Super Swampers, they amazingly perform well in terms of handling on trail. 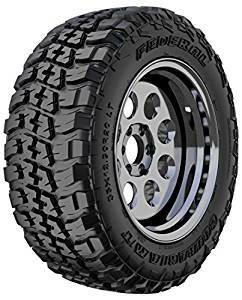 Most if not all road enthusiasts like these tires, and reported to experience the great performance off road without compromising much on regular roads. However these are the best options for those who do not mind some underperformance inside city in trade off for convenience of not having to change their tires for trail driving on weekends. For those who are completely off road enthusiast, Super Swamper TSL Bogger is best. These tires are usually agreed upon as best Mud or off road or best all terrain option. Roll Royce use these for their off road versions. As you see them on street, you will easily recognize them as Super Swampers that are popular for having huge lugs as well as super aggressive tread design. Do not worry, these treads and lugs aren’t meant for show purpose. The 3 stage lugs a deeper voids in treads help power up your vehicle through all types of harsh terrain. When you break these tires in, you will shred by any trail easily. The main drawback with it is that it isn’t well for city. Although they hardly legal for street, although company tied best for making some minor changes, the drive on highways and pavements will be loud and bumpy, especially beyond speed of 70 Mph your vehicle will vibrate and even damage your tires. When it is about road performance, it is incomparable. With you can go through mud and rocks easily. As the tires are thick, they can well absorb all the shocks and can’t be punctured because of sharp objects and debris. A small problem with it is that they aren’t actually made to grip side to side. While you are driving up a hill or encounter any type of slope you will feel some sideways slipping. For fuel efficiency, it is worst and give worst mileage, however you get great durability. All in all, Super Swamper TSL Boggers are best mud and off road tires for those who are road junkie. 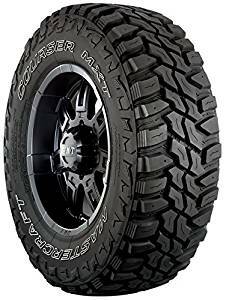 Mastercraft Courser MXT Mud Train tire is extremely perfect for individuals with light trucks and other extreme off-road enthusiast who are looking for aggressive traction and best handling on off road and on highways respectively. Mastercraft courser MXT has an attractive side biter design. 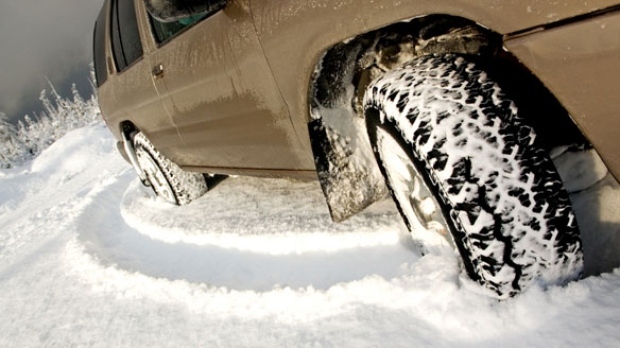 It has deep, wide tread grooves to give superlative off road mud or snow traction. Amount of rubber on road is optimized in order to give perfectly extreme terrain traction as well as enhanced feel of driving and at the same time deep, aggressive side biter design enhances the off road traction along with sidewall abrasion resistance. Scallops gives mud scoop effect to ensure extreme traction off road. Traction edges on alternating shoulder elements enhance extra biting edges to improve the lateral grip. Wide grooves between outer tread blocks enable easy clean out and increase road grip for greater traction. The siping for enhanced wet traction on highway provides extra biting edges to enhance traction off road. Even at ½ worn, around 80 percent of MXT’s of tire. Federal Couragia M/T series is just an answer to all offroad needs. These are the excellent tires for the money paid because it gives an aggressive tread design which offers above average traction in many conditions and at the same time it maintain the most quite ride on paved roads. It is built keeping rugged performance on the front. Federal Couragia uses high tread ply rating and 2 to 2 ply sidewall to give strong offroad protection on rough terrain. Its unique tread design gives extreme mud traction by combining large, siped and stepped lugs space by voids larger to help with self-cleaning of debris and mud. Within voids there is a groove which helps to clears rock and mud. 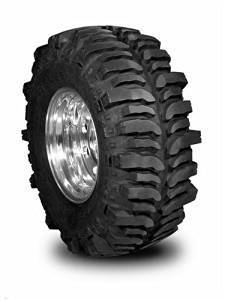 It is an excellent Mud terrain series tire which gives rugged off rad performance, unprecedented grip, traction and strength. Engineered pattern to clean external elements like mud or rocks to give consistent performance. It has an aggressive shoulder lug and block which give extreme traction on rock, mud, gravel or dirt and therefore it is designed to conquer impossible.